In the intestines of SIV-infected macaques, IL-21 treatment boosted the levels of immune cells that are important for resisting opportunistic infections. IL-21 has been tested in clinical trials with people fighting skin and kidney cancer, but not against HIV. An immunity-stimulating protein, IL-21, has shown promising effects in a nonhuman primate model of HIV infection. 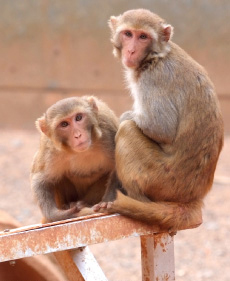 Treatment with IL-21 can improve several markers of immune system function in rhesus macaques infected with SIV (simian immunodeficiency virus), scientists at Yerkes National Primate Research Center and Emory University School of Medicine report. The results were presented Tuesday, July 22 at the International AIDS Conference in Washington DC. In the intestines of the SIV-infected macaques, IL-21 boosted the levels of immune cells that are important for resisting opportunistic infections, the scientists found. IL-21 has been tested in clinical trials with people fighting skin and kidney cancer, but not with people living with HIV. “We are excited about the data because this is the first study that shows a therapeutic intervention is able to preserve -- even if only temporally -- the intestinal levels of Th17 cells in nonhuman primates,” says senior author Mirko Paiardini, PhD, Yerkes researcher and assistant professor of pathology and laboratory medicine at Emory University School of Medicine. Th17 cells are a recently identified subset of T cells important for anti-microbial immunity at sites such as the intestines, nose and mouth, and a lack of Th17 cells is thought to leave someone vulnerable to opportunistic infection. In addition, Th17 cells play a prominent role in autoimmune diseases. The researchers also found IL-21 reduced the levels of microbial translocation and chronic immune activation weeks and months after the treatment period. In this study, the researchers treated SIV-infected rhesus macaques with IL-21 in five weekly doses starting two weeks after they were infected. All the animals began receiving antiretroviral therapy seven months after infection. Contributing to this research from Yerkes and Emory were: Luca Micci, PhD, postdoctoral fellow; Zachary Ende, graduate student; Guido Silvestri, MD, chief of microbiology and immunology at Yerkes; and Francois Villinger, DVM, PhD, chief of pathology at Yerkes. Savita Pahwa and Suresh Pallikkuth at University of Miami Miller School of Medicine also collaborated on the project, which was supported by the National Institute of Allergy and Infectious Diseases and the NIH Director’s Office of Research Infrastructure Programs.